Given that I’ve just changed jobs, it isn’t entirely surprising that I’ve had a lot of conversations recently about why I decided to do so. Generally when someone leaves a job, coworkers, managers, HR personnel, friends, and family are all interested in knowing why. Personally, I tend to give unsatisfying answers to this question, such as, “I wanted a better opportunity for career advancement,” or, “I just thought it was time for a change.” This is the corporate equivalent of “it’s not you–it’s me.” When I give this sort of answer, I’m not being diplomatic or evasive. I give the answer because I don’t really know, exactly. Don’t get me wrong. There are always organizational gripes or annoyances anywhere you go (or depart from), and it’s always possible that someone will come along and say, “How would you like to make twice as much money doing the coolest work imaginable while working from home in your pajamas?” or that your current employer will say, “We’re going to halve your pay, force you to do horrible grunt work, and send you to Antarctica to do it.” It is certainly possible that I could have a specific reason for leaving, but that seems more the exception than the rule. As a general practice, I like to examine my own motivations for things that I do. I think this is a good check to make sure that I’m being rational rather than impulsive or childish. So I applied this practice to my decision to move on and the result is the following post. Please note that this is a foreword explaining what got me thinking along these lines, and I generalized my opinion on my situation to the larger pool of software developers. That is, I’m not intending to say, “I’m the best and here’s how someone can keep me.” I consider my own programming talent level irrelevant to the post and prefer to think of myself as a competent and productive developer, distinguished by enthusiasm for learning and pride in my work. I don’t view myself as a “rock star,” and I generally view such prima donna self-evaluation to be counterproductive and silly. …what happens is that the more talented and effective IT engineers are the ones most likely to leave — to evaporate, if you will. They are the ones least likely to put up with the frequent stupidities and workplace problems that plague large organizations; they are also the ones most likely to have other opportunities that they can readily move to. Bruce describes a paradigm in which the reason for talented people leaving will frequently be that they are tired of less talented people in positions of relative (and by default) authority telling them to do things–things that are “frequent stupidities.” There is an actual inversion of the pecking order found in meritocracies, and this leads to a dysfunctional situation that the talented either avoid or else look to escape as quickly as possible. In virtually every job, there is a peak in the overall value (the ratio of productivity to cost) that an employee brings to his company. I call this the Value Apex. This is a little more nuanced and interesting than the simple meritocracy inversion causing the departure of skilled developers. Alex’s explanation suggests that top programmers are only happy in jobs that provide value to them and jobs to which they provide increasing value. The best and brightest not only want to grow but also to feel that they are increasingly useful and valuable–indicative, I believe, of pride in one’s work. This theme of motivation focuses more on Alex’s “value provided to the employee” than “value that employee provides,” but it could certainly be argued that it includes both. Boredom implies that the developer gets little out of the task and that the perceived value that he or she is providing is low. But, beyond “value apex” considerations, bored developers have the more mundane problem of not being engaged or enjoying their work on a day to day basis. Looking at this list, a number of these are specific instances of the points made by Bruce, Alex and Michael, so they aren’t necessarily advancements of the topic per se, though you might nod along with them and want to add some of your own to the list (and if you have some you want to add, feel free to comment). But where things get a little more interesting is that pretty much all of them, including the ones from the linked articles, fall into a desire for autonomy, mastery, or purpose. For some background, check out this video from RSA Animate. The video is great watching, but if you haven’t the time, the gist of it is that humans are not motivated economically toward self-actualization (as widely believed) but are instead driven by these three motivating factors: the desire to control one’s own work, the desire to get better at things, and the desire to work toward some goal beyond showing up for 40 hours per week and collecting a paycheck. Frustration with organizational stupidity is usually the result of a lack of autonomy and the perception of no discernible purpose. Alex’s value apex is reached when mastery and purpose wane as motivations, and boredom with a job can quite certainly result from a lack of any of the three RSA needs being met. But rather than sum up the symptoms with these three motivating factors, I’m going to roll it all into one. You can keep your good developers by making sure they have a compelling narrative as employees. Bad or mediocre developers are those who are generally resigned or checked out. They often have no desire for mastery, no sense of purpose, and no interest in autonomy because they’ve given up on those things as real possibilities and have essentially struck a bad economic bargain with the organization, pay amount notwithstanding. That is, they give up on self-actualization in exchange for a company paying a mortgage, a few car payments, and a set of utilities for them. I’ve heard a friend of mine call this “golden handcuffs.” They have a pre-defined narrative at work: “I work for this company because repo-men will eventually show up if I don’t.” These aren’t necessarily bad or unproductive employees, but they’re pretty unlikely to be your best and brightest, and you can be assured that they will tend to put forth the minimum amount of effort necessary to hold up their end of the bad bargain. These workers are easy to keep because that is their default state of affairs. Going out and finding another job is not the minimum effort required to pay the bills, so they won’t do it. They are Bruce’s “residue” and they will tend to stick around and earn obligatory promotions and pay increases by default, and, unchecked, they will eventually sabotage the RSA needs of other, newer developers on the team and thus either convert them or drive them off. The narrative that you offer them is, “Stick around, and every five years we’ll give you a promotion and a silver-plated watch.” They take it, considering the promotion and the watch to be gravy. At any point, both you and the developers on your team should know their narratives. This ensures that they aren’t just periodic, feel-good measures–Michael’s “diving saves”–but constant points of job satisfaction and purpose. The developers’ employment is a constant journey that’s going somewhere, rather than a Sisyphean situation where they’re running out the clock until retirement. With this approach, you might even find that you can coax a narrative out of some “residue” employees and reignite some interest and productivity. Or perhaps defining a narrative will lead you both to realize that they are “residue” because they’ve been miscast in the first place and there are more suitable things than programming they could be doing. The narratives that you define may not be perfect, but they’ll at least be a start. Don’t omit them, don’t let them atrophy and, whatever you do, don’t let an inverted meritocracy–the “residue”–interfere with the narrative of a rising star or top performer. That will catapult your group into a vicious feedback loop. Work on the narratives with the developers and refine them over the course of time. Get feedback on how the narratives are progressing and update them as needed. Alex thinks that departure from organizations is inevitable, and that may be true, but I don’t know that I fully agree. I think that as long as talented employees have a narrative and some aspirations, their value apex need not level off. This is especially true at, say, consulting firms where new domains and ad-hoc organization models are the norm rather than the exception. But what I would take from Alex’s post is the perhaps radical idea that it is okay if the talented developer narrative doesn’t necessarily involve the company in five or ten years. That’s fine. It allows for replacement planning and general, mutual growth. Whatever the narrative may be, mark progress toward it, refine it, and make sure that your developers are working with and toward autonomy, mastery, and purpose. Really great article! I had quit my job a few months back in favor of an opportunity that would allow me to grow professionally. A friend, and former co-worker, is still working for my previous employer. I fear he is slipping into the “collecting a paycheck” mindset, and would like to see him muster up the motivation to find something better. Hi Charles — thanks for the kind words. I’d say that in my experience, your friend’s situation is not terminal from a career perspective. I think a lot of people sort of mentally check out for a while and then leave, rather than becoming permanent “residue”. Hopefully your friend is in that camp. I’m glad you enjoyed the post, and I’m glad that you got out of a situation that had past its expiration date. Just the fact that your own personal narrative includes your own business (autonomy) and possible expansion (purpose) makes it sound as though your current situation is a happier one. I have to imagine that you’ll pass that on to anyone working for you – just as the “residue” seems to beget more “residue”, people with ambition and purpose seem to do the same. I have to point out that there are lots of jobs that are truly a body in a chair. This is unskilled labor, by definition. To fail to acknowledge that and treat every position as if it’s mission critical is much surer to lead to failure than the converse. I have met unskilled laborers who have taken their job with great pride, feeling a sense of purpose in fulfilling roles so much of our society takes for granted. Perhaps it’s the being taken for granted, not the menial-ity of the work, which makes such jobs “bodies in a chair”. The work must be done so appreciating that the work is being done and helping that person build their own narrative, in or out of that chair, is where a manager (and most of us in just being grateful) can help. Amazing post, I feel this will hit home with many developers out there, great job. Perhaps jobs are like houses over the course of your life. Each time you move, you get 5 or 6 new things that you didn’t have before, giving up the odd thing here and there in the switch. But the overall arc is that you collect nice things while not leaving too many behind. I imagine that you’ll find yourself in situations with fewer and fewer “holes” as time goes on. Here’s hoping, anyway. Being surrounded by good developers is an interesting perk and one I didn’t really consider when posting. I think that this certainly helps with both mastery and purpose, since you will naturally feel some positive pressure to improve and the group will probably do impressive things. And, you might be willing to trade autonomy for that, at least temporarily (or you might hit the trifecta and not need to). Alex, does this mean you would rather hire a developer that is currently employed. I just changed positions and had to answer lots of awkward questions about why I want to leave my current position. You are trying not to say anything bad about your current employer because you don’t want to come off as someone that doesn’t get along with anyone yet you are hoping to “evaporate” into a better position. Very good post. Really enjoyed reading. You captured really well the situation of many companies, expressed how passionate and talented developers feel about their jobs and what they expect from employers. Well done. Thanks for the kind words and for reading — I’m glad you enjoyed the post. I would agree that working in an apprentice role with senior devs is part of mastery, but when those senior devs don’t want to mentor the more jr devs, or are too busy with fire drills because “no one else knows how to fix it”, it creates almost a class system within the organization, and you start to see resentment by those that aren’t included to work on the more interesting projects. That’s a great point about the idea of a class system created by busy-ness. It’s the same system that makes it somehow a status symbol to be late for meetings or to skip certain activities, which I think is an element of a culture trending toward the destructive. 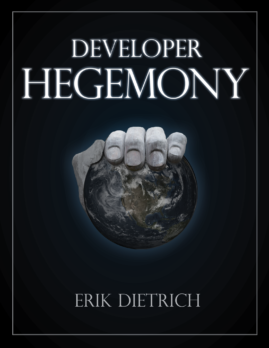 I’ve always kind of tended to be of the philosophy that really top notch developers with a lot of years and leadership under their belts develop a knack for making others more productive. They’re not putting out fires because they’re working ahead of time with junior team members to prevent them. Nice to see I maintained some consistency of position, particularly given that I didn’t have any recollection of this particular exchange when writing that recent post. This is exactly the kind of thing I’d love to see companies do. I’m of the strong opinion that the professional trajectory of developers is going to be similar to doctors or lawyers, which is going to mean that the “we own you from 9 to 5” relationship with companies is going to become less and less relevant. I’d much rather see companies *partner* with developers than try to employ them. Glad if the post helped you feel better or at least provided a sort of “I’m not alone” feeling. The pay-your-dues corporate culture that’s ubiquitous in society makes you feel like an oddball if you think anything other than, “I should count myself lucky to have a job.” I just think we can do better than that. I think this article hits home in any career field. More managers of people need to understand the motivations of their people and if they want excellence (and not all managers do, many being of the “it’s a paycheck” mentality themselves) then they will help build a winning narrative. I think the parenthetical point is a sad, but important one to realize. Unfortunately, there are going to be some managers that take the short-view and are not willing to make a good faith effort to assist in career development for their reports. Hopefully that’s a minority, but it’s definitely worth pointing out because not all situations are ‘fixable’ so to speak. …all other have already left or are in search for a new job right now! I agree with point (1), but with (2) I’d say this is only true of the pathologically honest. I think most people (especially the people who wind up being “Dead Sea” types) are willing to collect a wage, if a company will offer it, that exceeds the worth of their contributions. In a mercenary sense, that’s actually a great deal, so it’s economically rational of them to do this. And this is one of the key premises of the post — that companies tend to overvalue contributions from people based on the length of their tenure. sorry to correct you – with #2 I meant another aspect (opposite of yours) of meaning of my statement: people who are underpayed and don’t give their most but work “just good enough” not to be fired. they tend to minimize their contribution until they feel reaching THE critical point with working as less as possible and yet not to be fired asap. (I hate those most, though in fact they are not to be blamed, leaders are to blame ’cause they don’t get the point). but from our point of view (positive one) you’re of course right too. Oh, I see. I certainly agree with your point then. Unmarketable people who feel slighted because they are paid too little (in their estimation) will certainly look to minimize their contributions. I look at it in much more simple terms. One’s head can only be banged against the wall so many times. Once that limit is met, it’s time to move on. I think from a programmer’s perspective, that’s certainly true and probably the most common case for leaving earlier than one might. But I think they’ll also leave even if there hasn’t been too much banging of heads against a wall, but rather just simple boredom or stagnation too. Some weeks ago, my struggling company offered a generous buyout to the first 100 employees accepting to leave the company of free will. I know that my management did not ever read one of the articles refered to above, because within 3 days the best and youngest coders and project managers were all gone, increasing our companys average employees age by 10 years. This is one sure way how to loose your best programmers. That’s an excellent point. If the narrative is phony or manufactured, that should be a surefire sign that the employment/work arrangement doesn’t actually make sense. With the demand for developers being what it is, having to create make-work tasks to tide some of them over and stave off boredom seems like a sign of deep organizational incompetence. Oh man. Thank you for this article. It changed my life. This article came out at a time when I was going through some heavy soul-searching of my own. I will always be grateful for the service it provided in helping to synthesize my decision tree in addition to validating my narrative. Glad to hear it. This is one of the more reflective posts that I’ve ever written, so it was pleasing to me that it resonated with people. It’s nice to give voice to something that extends beyond your own experience. Forwarded this to my boss, who is trying to figure out how to attract and retain higher quality developers. Unfortunately, our agency exhibits every single issue you listed, and is not willing to solicit feedback from any actual developers. It’s time for me to move on, but maybe this article will help them improve in the future, if for no other reason than that it was written by someone who isn’t me. I hope it has the effect you’re seeking, but in my travels, that’s been somewhat rare. Companies that are failing hard at developer retention these days seem to be the ones that remain stuck in the “people are lucky to have a good job” mindset. They’ll forever stand around, scratching their heads and wondering how they’re so unlucky when it comes to hiring ‘loyal’ people. Wow, when I read the “narratives that might keep devs around” I got a warm fuzzy feeling inside. Damn, I’ll frame those somewhere, they are so true! Sadly I’m only confronted with items from the first list, two top devs have already left and more might evaporate. I’m not normally accused of giving people warm, fuzzy feelings with my writing, but I’ll take it 🙂 Sorry to hear about the current situation, but here’s hoping it improves or you wind up in greener pastures. I said on twitter a while back that life is too short for crappy projects — you only get a finite amount of codebases to work on in your life, so make ’em count! Wow, great article- In my role, I interview tech talent every day and I agree with several key points here. People “peak the summit” in the value apex both value they bring and the value they receive and things get boring. Good info for CEO’s and Dev Managers to take to heart. Glad you found it helpful! Feel free to use it as you see fit, per your message over LinkedIn. I’m always happy for the eyeballs on the page. Hi Antero, thanks for the kind worlds, and I’m glad you like the post. There’s been a lot of elapsed time since I wrote this, but it strikes me that what you’re talking about here could be construed as a subset of the “purpose” motivation. In your case, the purpose has to involve helping the users of the software that you’re building…? Is that fair? More or less. I mean it in a general sense that whatever I develop, I don’t want it to be a cause for discomfort. It was important enough to develop so it must be important enough to do right. Not hearing “I get that error again” from customer service is also a form of praise. Pushing boring repetitive tasks to others because “your time is too valuable” is also an energy drainer, especially on those occasions where it can be easily improved. Thank you, Erik – I come back to this piece often and tonight it has helped make up my mind about an important decision I have to make about my career. Thank you for the feedback and kind words! I’m glad if it offers you some impetus for good changes. Really enjoyed this post for the wide perspective and depth. The referenced articles are well worth a read on their own. Thanks for the pointer to them! Glad you liked — thanks for the feedback! Thanks for the excellent blog post. How can an organization distinguish the talented programmers from the “residue” ones during hiring process? Since ‘passion’ is a big selling point, many candidates merely fake it during the hiring process.